TORONTO, Jan. 31, 2012 /CNW/ - Aldridge Minerals Inc. (TSX Venture: AGM) ("Aldridge" or the "Company") is pleased to announce results from its recent drill campaign on its 100 % owned Kili Teke project in Papua New Guinea. 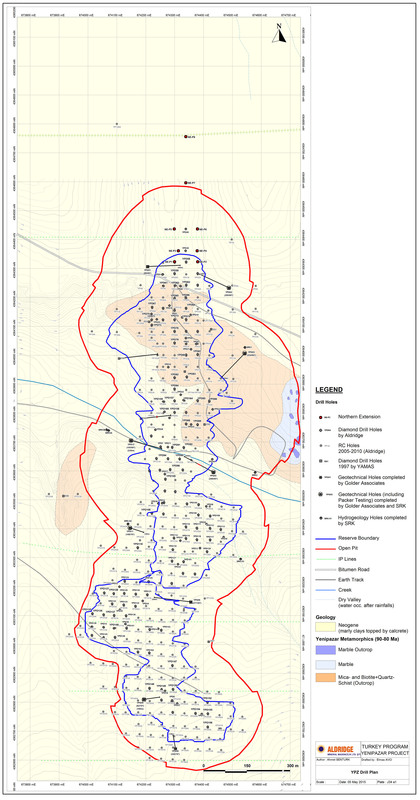 The drill program was preceded by an IP-geophysical survey, revealing large zones of chargeable ground to a depth of 300 m. Chargeability often coincides with the presence of sulphide minerals in this type of geological environment. The sulphides may host copper and gold mineralization as identified on the surface in rocks and soil samples with a footprint of about 2000 x 500 meters. More mineralization potential has been found with geophysics under adjacent limestones. Mineralization identified at surface indicates primarily porphyry copper and skarn, similar to the large Ok Tedi mine 150 kilometers to the west. Skarn mineralization can form very high grade zones at the contact of the porphyry intrusive and the limestones, and evidence of such zones has been found in surface float. All assays were conducted by PT Intertek Utama Services of Jakarta, Indonesia. The overall drill results confirm the geophysical modeling, although mineralization consists mainly of pyrite, in particular for the skarn mineralization encountered in KT002. Surface float includes rocks of pure copper sulphide, presumably from skarn mineralization (see Aldridge news release January 4, 2011), which have not yet been intersected by our drill holes reported today. Aldridge's VP Exploration and Director, Martin Oczlon said, "The two drillholes in mineralization confirm the overall model of porphyry copper mineralization accompanied by skarn in the adjacent limestones at Kili Teke. Unfortunately, technical problems during the drill program prevented us from testing a larger part of the mineralized zone. Holes KT002 and KT003 are merely 270 meters apart, in a zone with a geochemical and geophysical footprint of about 2000 x 1000 m. We remain very excited with the overall mineralization potential on our ground. Additional geophysical work and diamond drilling is needed to adequately test the porphyry copper and skarn mineralization at Kili Teke".